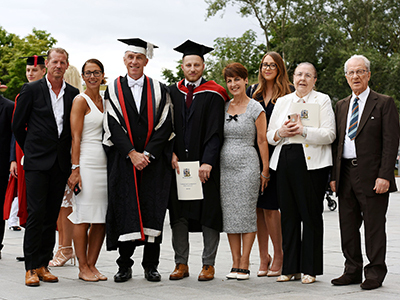 Nico’s parents Maria and Tony Davison, Vice-Chancellor Professor Paul Croney, Nico Davison, Anna Kennedy, partner Theanna Desanchez, and grandparents Maria and Tony Sammarone. Nico Davison graduated with a BEng (Hons) Instrumentation and Control Engineering with Industry. It comes five years after his auntie, prominent autism campaigner Anna Kennedy OBE, was awarded a Doctor of Professional Achievement from Teesside University. And Anna, who is also a patron of the charity Daisy Chain, was delighted to be in the audience to see Nico pick up his degree. Nico, 25, from the Acklam area of Middlesbrough, was also joined by his parents, grandparents and girlfriend for the ceremony. He said: 'It is a really proud feeling to be graduating and when I first started the course I never imagined getting to this point. 'The ceremony itself was very prestigious and the atmosphere was fantastic. It was nice to have all my family with me - Anna has always spoken extremely highly of Teesside University. During his degree, Nico completed a one year placement at CF Fertilisers in Billingham and he continued to work at the company part-time during his final year. He has since been taken on full-time as an Instrument and Electrical Support Engineer. Speaking about her nephew’s success, Anna said: 'He has done extremely well and we are all really proud of him. Seeing him cross that stage to pick up his award was a special moment and it brought back memories from when I was lucky enough to receive an honorary degree.